Let your child’s imagination take over with this authentic Sooty hand puppet! They can put on their own Sooty show, and tell enjoyable stories that will entertain the whole family. 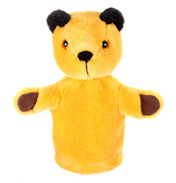 Made from super soft, plush fabric, this lovable little bear will be a hit with everyone. No Sooty fan should be without one!